Hello there! We all have different reasons for scrapbooking. Some do it for fun, some to tell stories. I do it for a little of both reasons. I'm all about the photos and the meaning behind them, but I am not an epic story teller by any means. Today's topic on the Get It Scrapped blog, creating more room for journaling on our scrapbook pages helped me to write a bit more on this layout. The day we arrived in our new home, I expected our son to be confused and upset. Instead, I found him curious about his new surroundings and content to have his things around him.This layout tells this story as a whole, but each photo has its own story. I used journal spots around the page to tell details about some of the photos. The title ties each of these stories together. 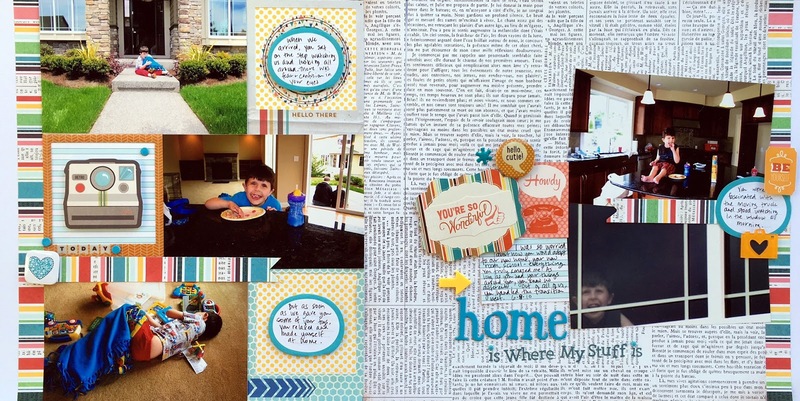 The design of this page is well suited for this type of journaling. On the left side, there are open spaces to include journaling. On the right side, I created one more spot, then completed the story near the title. Using the same paper for each spot brings cohesion to both sides of the layout. The creative team has several more ideas for getting more journaling on the page on the Get It Scrapped blog. Thanks for stopping by my creative view today. I've got more to share, so come back again soon.